Kamen Rider: Climax Heroes Fourze (仮面ライダー クライマックスヒーローズ フォーゼ - Kamen Raidā Kuraimakkusu Hīrōzu Fōze) for the Wii, is a fighting game that was released in Japan on December 1, 2011 and developed by Eighting Co., Ltd.. The game was released to commemorate the 40th anniversary of the Kamen Rider franchise. 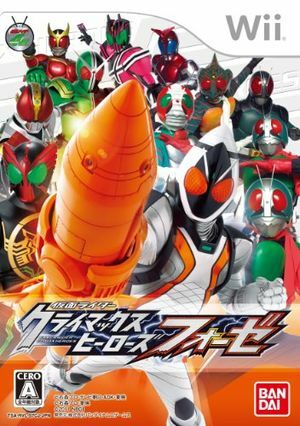 Introduced to the game are Kamen Rider Fourze and The Showa Era Kamen Riders (V1,V2,V3,Amazon,Black,and Black RX). Also in the roster is Kamen Rider Black's primary antagonist, Shadowmoon. Riderman makes a cameo appearance as V3's striker. The graph below charts the compatibility with Kamen Rider: Climax Heroes Fourze since Dolphin's 2.0 release, listing revisions only where a compatibility change occurred. This page was last edited on 15 January 2018, at 08:30.